FAREWELL AND A BIG, BIG, BIG THANK YOU! Wow! Last week marks 35 years since I accidentally fell into the Travel industry. It was only ever meant to be a young man's short-term, part-time, escapade abroad. With no Travel industry experience, I was taken on after a telephone interview on a Friday afternoon. Within 2 hours I was at London's Victoria coach station loading 50 guests for a 24 hour coach journey to Austria where I was to immediately turn-around and bring a different group of 50 guests back to London on that same 24 hour coach journey. Incredibly bad weather, and umpteen other things, meant the weekend did not go to plan. I found myself bringing hundreds back to the UK, and it took closer to 42 hours than 24 hours to get back. The more chaotic and impossible things seemed, the more I seemed to rise to, and relish, resolving the situations. I had found my calling. I was not long back when a call came asking if I would like to swap the part-time weekend job they had offered three days ago for a full-time ski rep' job, living in Austria, starting immediately. Without hesitation I accepted and, within the hour, was in a taxi to Lydd airport (Kent) where I joined another coach group to Austria. I have never looked back since that fateful weekend in January 1983. It was fate. It was all meant to be. I fell in absolute love with Austria, and had some truly wonderful, never-to-be-repeated, years working for 'Hards Travel Service' & 'Summerplan' which were headed by a charming man called Cliff Hards, who (I guess) was some 30 years my senior. He had started his Travel business, from scratch, after leaving university and travelling (apparently) in a black London taxi to Austria where he fell in love with the beautiful Ziller Valley (and the beautiful Helena from the Ziller valley). He then started taking British guests there, and to many other places, for well over 30 years. Cliff Hards was an inspiration and role model to me. While in Austria, things progressed to a management role for me very quickly. I was doing a great job, for a great firm, and having a ball! After a few years in Austria, love of and marriage to Marcia brought me back to the UK where I then created this firm from scratch. Initially we offered value-for-money coach holidays to Austria, Italy, Belgium, Spain, France, Holland and later Guernsey, Jersey, and Isle of Wight. All of that under the brand "TIMESCAPE HOLIDAYS". That did very, very well for the first 17 years. Then came the era of low-cost flights with Easyjet and Ryanair etc so we swapped the value-for-money formula from coach to air holidays under the brands of "ISLAND GETAWAYS", "AUSTRIAN GETAWAYS", "ITALIAN GETAWAYS", "SPANISH GETAWAYS" etc etc. That was 18 years ago and that too, has done very, very well. I still feel like I have the heart and spirit of a youngster (you ought to see me when I party!!!). Alas, I will be 60 years of age later this year. I feel, as does my lovely wife Marcia, and my good friend, colleague, and General Manager extraordinaire Marion, that we all wish to sail off (literally) and try this thing we've heard of called (semi) retirement. We felt that the time is right, while we all still have our health & wealth, to leave aside the 12-14 hour days, 365 days a year Travel business and have a (mature persons) GAP YEAR! There's a lot of living still to be done. Here's the deal; If we find this (semi) retirement is not all it is cracked up to be then, as Schwarzenegger would say... Hasta La Vista Baby... we'll be back (next year)! If we come back next year, then don't forget us. If we come back, after having had a year off, we'll be re-invigorated with new destinations as well as old favourites AND we'll have eye-watering deals for you which, like always, you'll not be able to resist!!! However, if we find that this (semi) retirement malarkey to be very much to our liking then, as Frankie Valli (and much later the Bay City Rollers) said it's... "Bye Bye Baby, Baby Good Bye"! If we don't come back, then I wish to give a heartfelt BIG, BIG, BIG THANK YOU to all our customers & guests over the 35 years. I especially thank our 'regulars' who booked 2, 3 or 4 times a year with us. I even thank the more challenging ones (you know who you are!!!) who kept us, shall we say, on our toes. We estimate we have been a part of and/or organised the holidays of up to around 1 MILLION guests over these 35 years. So, a 1 MILLION thank yous are hereby sent. I also want to thank ALL our suppliers over the years, the printers, the ad makers, the newspapers, the web makers (especially Norman but not his grumpy friend), the insurance brokers, the Tourist Boards (especially Wendy, Chloe et al), the ferry firms (especially Jonathan who takes a broadside in his stride), the coach firms (especially Martin and all my friends at Rofan Reisen and Oriana in Malcesine), the air charter firms (especially Malcolm C at CityFlyer/Aurigny and Ken and the crew at European), the car hire firms (especially Kerry, Dave & gang), all the hoteliers in all the countries (some of whom are now lifelong good friends such as Herman and the gang at VJ, Federico, Dina, Mark F, Mark G, Jordi, Frank and, of course, 'our' Werner). I also thank all my staff over 35 years, but particularly thank... the No. 1 guide of all time Ambrish,... 'good ole Kath', the ever-energetic Mr. ('you had the right job at the wrong time') Mallon,... '(bossy boots) Marion' and, of course, my very special wife Marcia. The last 35 years has been a terrific team effort. I am priviliged to have been the Captain who set the course and stayed at the Helm of such a great crew through choppy waters and calm seas. It's been incredibly hard work, but we have had so much fun and laughter along the way. All in all, the last 35 years have, for me, genuinely flown by and, as far as I am concerned, and as Ol' blue eyes himself would say... "It was a very good year"! A GOODNIGHT FROM ME, AND A GOODNIGHT FROM HIM! 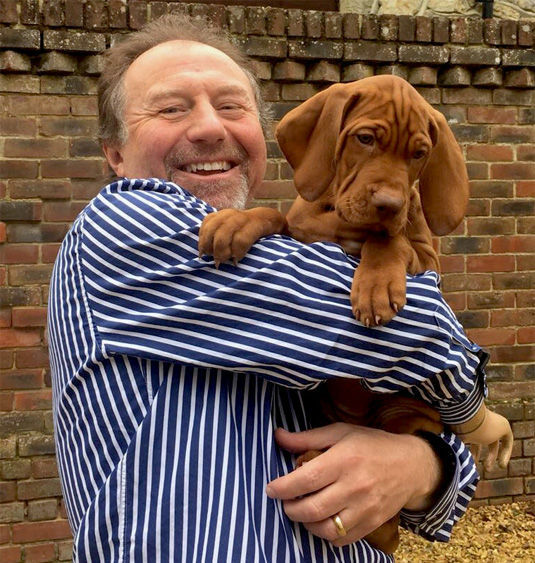 To celebrate this (semi) retirement, and to keep me fit & active, I recently treated myself to the cutest Hungarian Vizsla puppy that I've called Bruno. I admit I'm besotted. As such, that's all I've got time for now, as I have to go walk the pup. It's therefore... "a goodnight from me, and a goodnight from him! ".